Originally set as a gold circlet inset with imitation pearls and paste (cut glass), St. Edward’s Crown has seen multiple transformations in its many years. It was King Egbert (death date 839) who first added ray points to the simple circlet in order to mimic the styles of the eastern emperors of his day. The addition of pearl tips on the rays was credited to King Edward the Confessor (death date 1066). Though some historians write that William of Normandy (death date 1087) wore a simple circle flowery in lieu of St. Edward’s Crown, one historian, Francis Sandford, noted in his book A Genealogical History of the Kings and Queens of England (1066) that William’s seal featured him wearing the crown with the arches and the cross pattee. William Rufus (death date 1100), son of William of Normandy, was reported to have worn St. Edward's Crown, having further enriched it with points. Later, Henry I (death date 1135), added the fleur-di-lis, and wore it as it is seen on his great seal and coin. 'Maude', really Empress Matilda of England (death date 1167), daughter of King Henry I, requested that her crown have points with leaves/flowers extending much higher than the points. During the two hundred years following her reign, fleur-di-lis were added once again in varying states, depending upon the “whim” of the sovereign of the day. King Edward III (death date 1377) is credited with the addition of the cross pattee interspersed among the fleurs-di-lis, and his son Edward IV (death date 1483), is shown sitting with a crown closed by arches with a rim of fleurs-di-lis, alternating with crosses pattee, which rise from a circlet with four arching bars. It appears that Edward V (death date circa 1483) and Richard III (death date 1485) wore the crown in similar style. For Henry VII (death date 1509) and Henry VIII (death date 1547), the arches were embellished with pearls and enriched with precious stones and jewels, which was the prevailing fashion of the crown until the reign of William IV (death date 1837). For his coronation in 1830, the arches were raised to a higher point by his order, transforming it into the crown we know today as St. Edward’s Crown. 1. Official Website of The British Monarchy, The. "The Crown Jewels." Accessed May 28, 2012. http://www.royal.gov.uk/The%20Royal%20Collection%20and%20other%20collections/TheCrownJewels/Overview.aspx. 3. Jewelry Gems About. "British Crown Jewels." 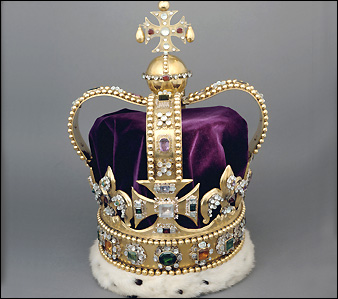 Accessed May 28, 2012. http://www.jewelrygemsabout.com/gem-history/british-crown-jewels.html. 4. Robson, Thomas. 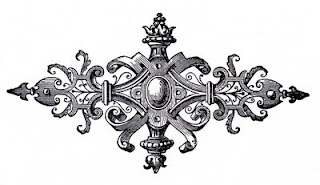 The British Herald; or, Cabinet of armorial bearings of the Nobility. Sunderland: Turner & Marwood, 1830. 5. Ian Marr Rare Books. "Entry #81, Sandford (Francis)." Accessed June 13, 2012.http://ianmarr.co.uk/81-sandford-francis-a-genealogical-history-of-the-kings-and-queens-of-england-and-monarchs-of-great-britain-from-the-conquest-anno-1066-to-the-year-1707-in-seven-parts-or-books-containing-a-di/.